Wooden Hospital Doctor Nurse Playset is a wooden hospital building which has hinges and opens up to reveal a surgery. 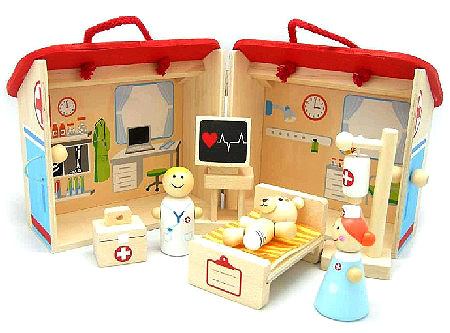 This wonderful role play set has doctor and nurse figures a wooden teddy patient, first aid box, bed, drip with stand and also a heart monitor. All the pieces fit inside the hospital building when pack-up time comes and the hospital roof has carry handles. We like this because: "Love that the hospital building is also the box."